We're back. Sorry for the delay fans. What? A whole episode with just Daryl and Beth? Can this possibly ever work? Well it turns out that it works quite well, actually. The opposing personalities of the two characters makes it interesting. Daryl has shut down emotionally and Beth can't stand the silence. They both go on a search for “hooch”, as Daryl calls it, and end up in a run-down house which symbolizes Daryl's past. In the end, they burn it down. A cleansing, if you will. Daryl, didn't feel comfortable in the country club scenario but he felt right at home in the crap shack. Shows more about Daryl's character. 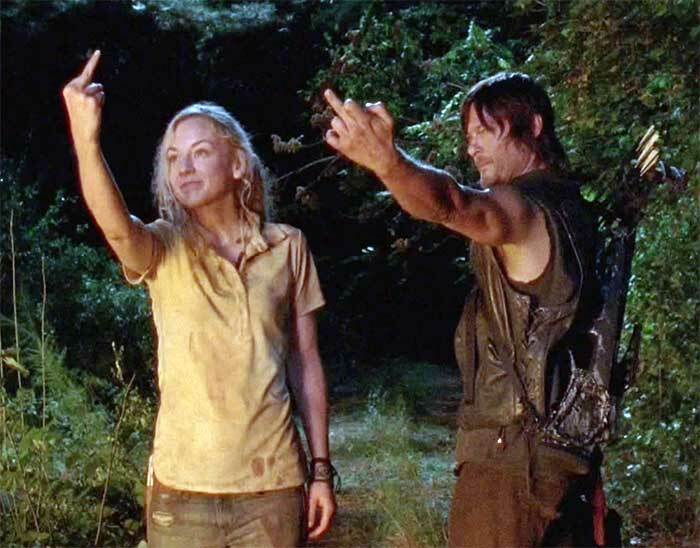 Daryl and Beth say “screw you” to the past.